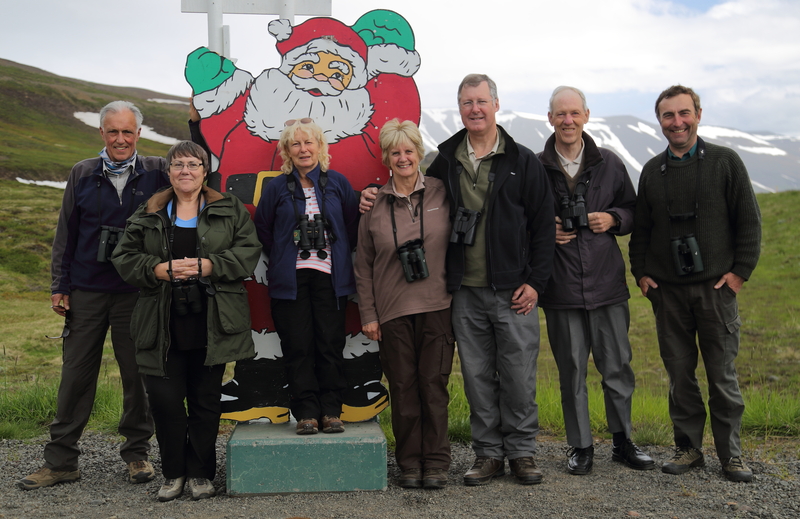 We begin with a ferry ride from Stykkishólmur, across a calm Breidafjördur Bay, to the little island of Flatey, where the welcoming party includes a tame Greylag, numerous Redshanks, Snipe, Arctic Terns, Meadow Pipits, White Wagtails and a Wheatear, with Snow Bunting and Redwing singing from the roof tops. The target bird here is the very rare Grey Phalarope, and within forty five minutes of landing we find a stunning yellow-billed female in pristine brick-red breeding plumage, feeding on the weedy shoreline in the company of two less resplendent males. After brilliant views the trio disappears further along the shore, but within a few minutes two females return and show even better, this time in the same scope view as a couple of Red-necked Phalaropes! What an incredibly lucky find. Further exploration of the island reveals just how numerous and tame the Red-necks are, while just offshore, there are plenty of Eiders, many with ducklings, along with Red-breasted Mergansers, Shags, Black Guillemots, Puffins and Kittiwakes. After a hugely productive morning, we catch the lunchtime ferry back to Stykkishólmur and head for the Snaefellsnes peninsula. 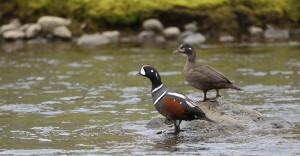 By now it is lovely weather for ducks and we find a pair of Harlequins on the river flowing swiftly alongside route 56. The drake has a gorgeously patterned navy blue, white and chestnut plumage. Heading west along the coast of the wild Snaefellsnes peninsula to the cliffs of Þúfubjörg, our target is Brünnich’s Guillemot and we find a group of seven sitting on two narrow ledges just below the cliff top. There are also plenty of Fulmars and Kittiwakes and a few Common Guillemots and Razorbills. On the way back to Stykkishólmur, roadside pools produce Scaup and Whooper Swans, with Whimbrel and lovely rusty-red Black-tailed Godwits probing the lush meadows, while several Arctic Skuas add to the excitement. Leaving Stykkishólmur at 7.55am on a long scenic drive heading east, we soon find a smart Golden Plover bathing in a roadside pool, shortly followed by hundreds of Whoopers on and around Alftafjördur. Within an hour of setting off we spot an Arctic Fox with an unusual uniform dark chocolate summer coat, foraging beside the road, and as it saunters up the rocky slope, flushing a pair of Wheatears as it goes, we even manage to get it in the scope, revealing its whiskers, and sharp golden eyes staring back at us; another remarkably lucky sighting. By mid morning we are in luck again, this time with a red-wattled Ptarmigan, sitting proud of the sparse tundra vegetation, with the sea for a backdrop. The deeply indented coast comes and goes along the journey and next time we meet it, we are looking down on a pair of Great Northern Divers in prime monochrome breeding plumage ‘anchored’ just offshore, a stark contrast to the distant views of their grey shapes so often seen off the British coast in winter. At lunchtime we are basking in warm sunshine as a skein of two dozen Pink-footed Geese go chattering by, and in the afternoon, we pass several pairs nervously guarding their downy goslings. Further east we visit Godafoss, one of the most impressive waterfalls in Iceland, before arriving at the famous Lake Mývatn, where a small unprepossessing roadside pool serves up an amazingly varied ‘smorgasbord’ of avian delights; Redshank, Dunlin, Whimbrel, Golden Plover and Red-necked Phalarope represent the waders on the shore while the surface is dotted with several species of waterfowl including four Whoopers, a small flock of Wigeon, several Barrow’s Goldeneyes, a drake Common Scoter with two ‘ladies’, a Red-breasted Merganser and a Long-tailed Duck, as well as a Red-throated Diver! All this on a small ‘duck pond’, thanks to the profusion of insect life which abounds around ‘the Lake of Flies’. On the main lake we also find our first Slavonian Grebes and then scope two Gyr Falcon chicks on a nearby cliff, well fed thanks to the profuse birdlife which thrives on the rich insect diet. Journey’s end is the Hotel Reynihlid where vociferous Snipe, Redwing and Redpoll are car park birds! Today we stay local with a clockwise circuit of the lake. The huge grey Hverfjall crater looms over the east side of the lake and after a little thought we accept the challenge of climbing to the rim for a panoramic view of the outstanding landscape, with the blue lake dotted with craters, while steam rises from distant fumaroles. Next stop is Dimmuborgir for a stroll through impressive lava formations, where many of the rocky pinnacles are used as song posts by Redwings. Back at the lake we find a bay choc-full of Barrow’s Goldeneyes, with deep purple glossy heads, representing most of the European population of this otherwise North American duck! 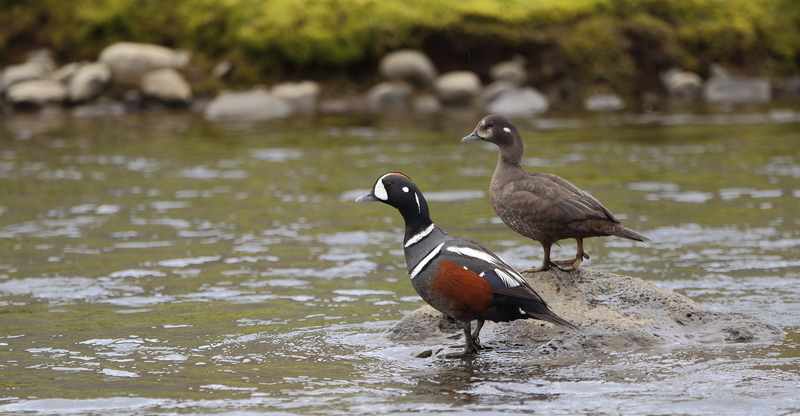 At Skútustadir, we circuit a lake within a lake, enclosed by several craters, where we enjoy incredibly close views of Great Northern Diver, Slavonian Grebe, Scaup, handsome drake Long-tailed Ducks, and ridiculously tame Red-necked Phalaropes by the ‘shed load’! This evening the lake remains bathed in brilliant sunshine until sunset at 11.30pm! After a brief dip below the mountains, the sun provides yet another beautiful warm sunny day with a deep blue sky, ideal for highlighting the sulphurous colour of the bare ground at Námafjall Hverir, where the Earth’s crust is so thin that steam heated by magma gushes out from vents called fumaroles, and pools of grey mud boil and plop like cauldrons of overheated porridge. Next stop is Leirhnjúkur, where steam rising from cracks in an unearthly landscape of crumpled black lava is reminiscent of the scene which might follow a nuclear holocaust, and yet even here there are Snow Buntings! Driving east through a dusty rocky desert, which could be in North Africa were it not for the surrounding panorama of snow-covered mountains, we reach a canyon where tons of glacial melt water thunder every second down a 147 foot sheer cliff, whereupon the spray creates a rainbow across the canyon. This awesome spectacle is Dettifoss, Europe’s mightiest waterfall; the grand finale to an amazing day in an amazing place. Before leaving the fabulous Mývatn area, we scan through the hundreds of Wigeon in Neslandavík Bay, hoping for an American Wigeon, reportedly seen here yesterday, but without luck, although a close view of a male Long-tailed Duck, already in white winter plumage, is a nice consolation. Húsavík, on the nearby north coast, is the whale watching capital of Iceland and we set sail across a calm Skálfandi Bay hoping for a whale. 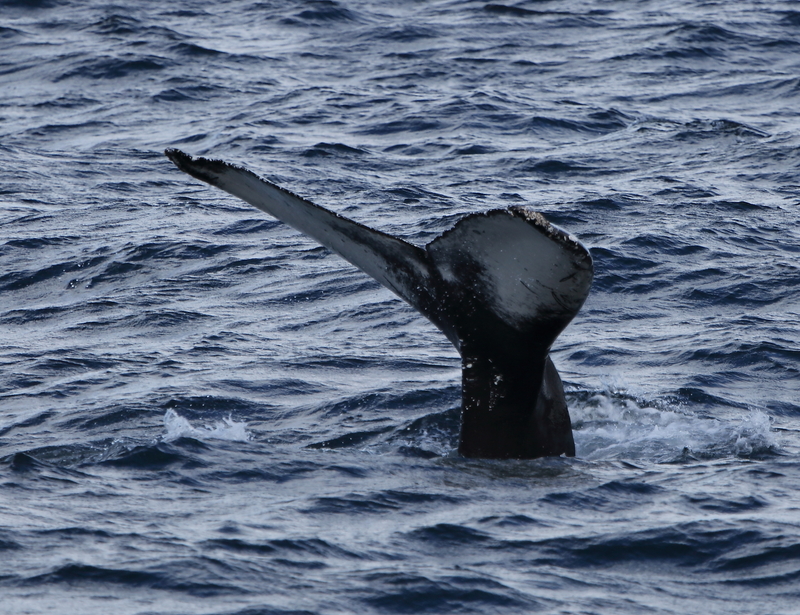 After just fifteen minutes sailing we see a thirty five ton Humpback Whale, with that classic tail fluke view, as it rises above the surface while dripping water before making a shallow dive. The snow-clad mountains on the far side of the bay provide a magnificent back drop for a frenzy of activity with several White-beaked Dolphins leaping clear of the water while at least half a dozen Humpbacks in every direction around the boat, sometimes at close range, repeatedly surface, blow and slap their tails amid hundreds of Kittiwakes and Fulmars, raising a cheering chorus of wows from the onlookers on board. What a fantastic experience. Back in Húsavík, a check through the gulls reveals a chalky white first summer Iceland Gull chilling out on the beach alongside a clearly larger Glaucous Gull in very clean looking adult plumage; a nice find. It’s the longest day and we have a long but scenic drive from north to south on a rough gravel road through the desolate tundra landscape of the uninhabited interior, spotting Golden Plover and more fabulous looking Harlequin Ducks en route to the bubbling hot springs and gushing fumaroles at Hveravellir, almost in the dead centre of this amazing country. Continuing south between the Hofsjökull and Langjökull ice sheets, the ‘road’ gets even rougher and dustier and the terrain even more desolate, and a virtual desert, until we reach to the Hvitá river, as blue as copper sulphate solution, where we spot more Harlequins. Eventually the tarmac reappears as we approach Gullfoss, an impressive double waterfall, fed by melt water from the massive Langjökull glacier. 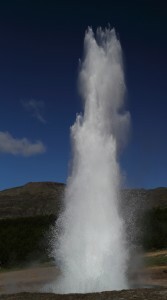 Journey’s end is the Geysir Hotel providing yet another gourmet meal, this time within sight of the spouting Geysir. After a ‘white night’, it’s a cloudless blue sky first thing this morning, and the only water vapour in the air is from the geothermal activity across the road from the hotel, including the famous Geysir, which is a pool of hot water which ebbs and flows with a gentle welling action, gaining momentum each time, before exploding with clockwork regularity into a plume of steam as high as a house! Our next stop on the ‘Golden Circle’ is Þingvellir National Park on the North Atlantic rift between the Eurasian and North American tectonic plates, which are slowly tearing Iceland apart! This afternoon, we follow up recent reports of American Wigeon and King Eider, without success, although the sea mist is not helpful. Last stop is Reykjavík for a spot of sightseeing before another delicious meal. 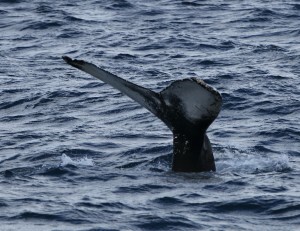 We spend our last day exploring the lunar-like landscape of the barren Reykjanes peninsula, where there is an abundance of life offshore from the point at Gardskagi including a couple of Great Northern Divers, lines of Razorbills passing to and fro, and hundreds of diving Gannets, with several spouting Humpbacks occasionally breaking the surface with their arching backs before sliding their tail flukes below the surface. Nearby we find our second Ptarmigan of the trip, showing well beside the road, with plenty of white on the underparts. Further south we pass through a massive colony of Arctic Terns, with several posing obligingly on fence posts right next to the road to the Reykjanestá headland, which is still plastered in Kittiwake nests although the Great Auks are sadly long gone.